To address these issues, government bodies around the world have published guidance documents, set policies and considered regulations. These have been largely based on research that examined nanosilver release from new, unused consumer products or laboratory surrogates, but not actual FCMs during and after use. In a new paper, scientists from the U.S. Food and Drug Administration (FDA), the National Institute of Standards and Technology (NIST) and the U.S. Consumer Product Safety Commission (CPSC) describe how they simulated knife motion, washing and scratching on nanosilver-containing cutting boards to see if consumer use practices affect nanoparticle release. Using a test method developed at NIST, five different "use scenarios"–each simulating a different type and level of wear commonly seen with human use–were conducted by moving three abrasive surfaces back and forth across samples of nanosilver-enabled cutting board material. The researchers hope their test method will help regulatory bodies identify if any safety or health risks exist from silver nanoparticles in food contact materials, and if so, find ways to deal with them appropriately before they are approved for sale in the United States. "A custom-designed razor blade replicated knife cuts, a piece of scrubbing pad mimicked normal dishwashing conditions and a tungsten carbide burr imitated scratching by metal utensils," said NIST physical scientist Keana C.K. Scott, one of the authors on the paper published in the journal Food Additives and Contaminants: Part A. "The washing and scratching scenarios were done at one or two levels of abrasion; for example, 500 and 5,000 cycles for the scratching simulation." After the abrasion runs, the NIST researchers used sticky tape to see if loose silver nanoparticles were present and could be removed from the worn cutting-board samples. Scanning electron microscopy (SEM) at NIST and inductively coupled plasma mass spectrometry (an incredibly sensitive method for detecting metal ions) at the FDA showed that bits of cutting board polymer were released by abrasion and that some of these contained embedded silver. 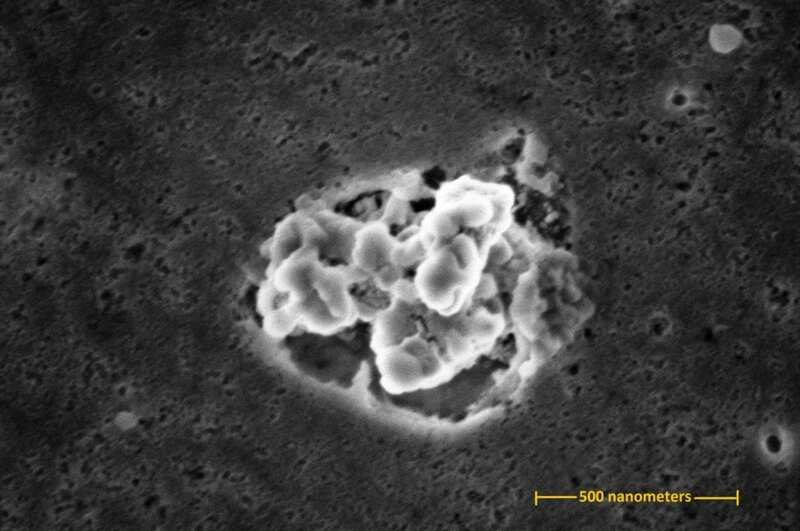 However, free silver nanoparticles were not found on the SEM-examined tape. FDA scientists also determined how much, if any, silver ions and intact silver nanoparticles would migrate away from cutting boards when exposed to water and acetic acid. They found that the concentrations of ionic and particulate silver found in both solutions were very low. In fact, there was no discernable difference in the silver migration observed from the new and unused nanosilver-enabled cutting boards compared with the ones that were cut, washed or scratched. Based on their findings, the NIST and FDA researchers suggested that future studies should examine whether a combination of use scenarios would increase the amount of silver ions or nanoparticles released. For example, they said, perhaps washing the cutting board after scratching would have a different impact. "Now that we've shown that the migration evaluation method works, it can be used to help answer this and other questions about what happens when people use FCMs with nanoparticles," said NIST research chemist David Goodwin, another author on the paper. "In turn, those findings should be valuable for the bodies that must determine any health or safety risks." Paper: S. Addo Ntim, S. Norris, D.G. Goodwin, J. Breffke, K.C.K. Scott, L. Sung, T.A. Thomas and G.O. Noonan. Effects of Consumer Use Practices on Nanosilver Release from Commercially Available Food Contact Materials. Food Additives and Contaminants: Part A, October 23, 2018. DOI: https://doi.org/10.1080/19440049.2018.1529437.